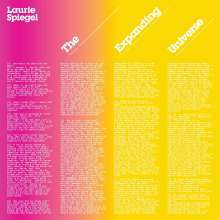 Der Artikel Laurie Spiegel: The Expanding Universe wurde in den Warenkorb gelegt. 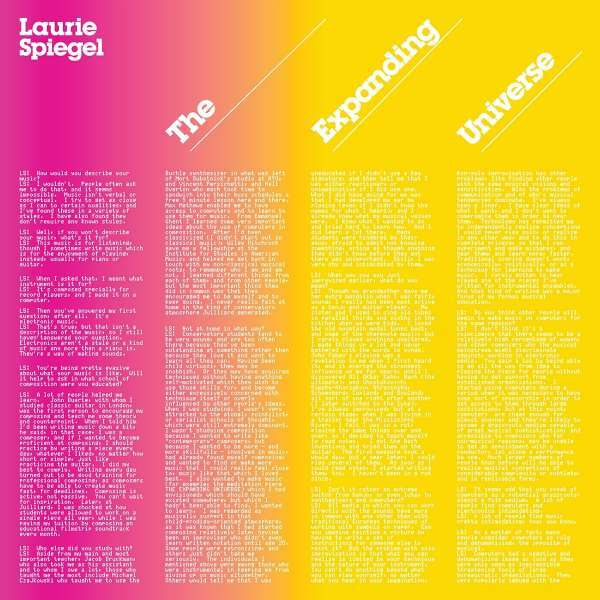 The Expanding Universe is the 1980 debut album by computer music pioneer Laurie Spiegel. The original album is reissued here as a massively expanded 2CD set, all four original album tracks plus an additional 15 tracks from the same time period. Since this album's first reissue in 2012, it has gone on to be widely established as a classic of 20th century electronic music. Some of the well-loved works included in this set are »Patchwork«, the »Appalac hian Grove« series, »East River Dawn« and »Kepler's Harmony of the Worlds«, which was included on the Golden Record launched on board the Voyager spacecraft. The pieces comprising The Expanding Universe combine slowly evolving textures with the emotional richness of intricate counterpoint, harmony, and complex rhythms (John Fahey and J.S. Bach are both cited as major influences in the original cover's notes), all built of electronic sounds using the Groove system at Bell Laboratories during the 1970s.